When checking out makeup, nothing excites me more than trying out new lip colors. Thanks to Maybelline and Refinery 29, last weekend I took three shades from Maybelline’s new Color Elixir by Color Sensational for a spin — Signature Scarlet, Fuchsia Flourish and Raspberry Rhapsody. My three essentials for a good lipstick or gloss? Lasting power, that feel-good hydrating sensation and pigmentation. Sure, Color Elixir performs well in these areas, but the real game changer here? The wedge-shaped applicator. Anything that helps to ease application scores points in my book. I was able to swipe on the gloss with one easy stroke (before applying that finishing touch layer) — even to my bottom lip line which I always have the most trouble applying evenly on both sides. Snag these Maybelline Color Elixir shades and more (20 total in the collection!) at your local drugstore for under $8. Pretty damn good, right? *Post sponsored by Refinery 29; all opinions are my honest impressions. Just came back from a family vacation in Arizona where we visited Sedona, Scottsdale and the Grand Canyon (breathtaking!). Knowing we’d be doing a bit of hiking, I was hard-pressed to find a backpack before we left. Not being a backpack owner since high school, I scoured online looking for something compact and picked out the Herschel Supply Co. Survey Backpack. With magnetic snaps, it’s just the right size to fit all your essentials (including a DSLR). Though I went with this army color for versatility, it’s offered in a slew of other colors. Retails for $55. Trying to get my blogging mojo back. Because sometimes you just need to get away… and when you return, you wonder why you stayed away so long. Yes, I straight jacked that out of a SATC episode. While it’s been difficult to keep up with outfit posts, here are a few snaps of what I’ve been wearing lately. I’m BACK. So sorry I’ve neglected you over the past month! After deciding I wanted to steer my blog in a new direction I took a brief hiatus, stepping back to reflect, brainstorm, and dig a bit deeper about what I really want to focus on for the next few years. For me, this is a passion project and once that feeling of passion starts to fade, you have to either do something about it or let it fade into the sunset. I’m hoping to implement the former. While I work on a revamp, regular posting will resume. Thanks so much for your patience as I rediscover my passion… it really means a ton to me! 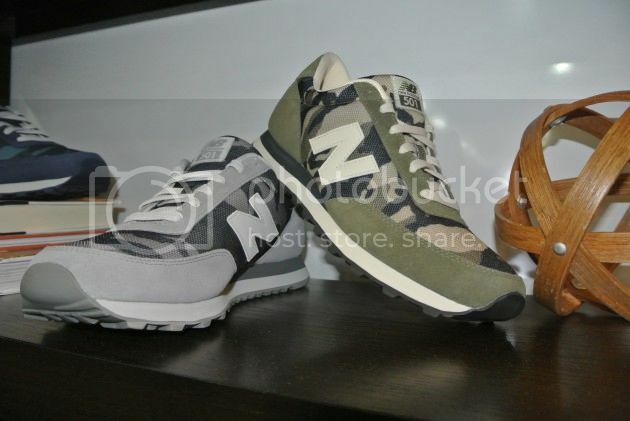 Here’s a photo of the New Balance camo 501 men’s sneakers I spied on KicksOnFire, snapped earlier this year at PROJECT Las Vegas. I plan to pick these up when they’re released in women’s sizes June 1. Only downside? For women, the colorways are pink, blue and green. Sorry, but real talk, women always get screwed out of the “good” colors. Women like gray sneakers too! I mean, I get it. Yes, women like pink. BUT pink camo is an entirely new ballgame and a strikeout, IMHO. Suppose blue camo it is then!